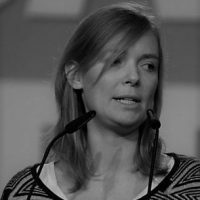 Anna Cavazzini is co-ordinator of the German Green’s working group on the EU and an anti-nuclear activist. The German coalition agreement contains many empty phrases and few concrete suggestions. There is absolutely no sign of a European idea, let alone vision. The German Green’s manifesto tries to strike a difficult balance between a clear commitment to Europe and a vision of another, greener Europe. In doing so, it makes it very clear that with Greens in government European politics would be different.